After a successful career in property surveying, Nigel was looking for a new challenge and joined established partner Jane in retail, opening Frontiers Man as a male equivalent of their existing Frontiers Boutique. Seeking to fill a gap in the Edinburgh market for menswear boutique shopping quality independent brands, Frontiers Man focuses on understated style and timeless pieces. 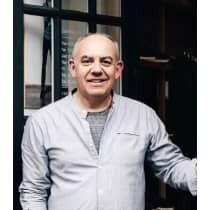 In the last 18 months Nigel has been building up contacts and suppliers with leading names such as Folk & Sandqvist and have become a destination for independent menswear brands in the Scottish capital. "The right kind of retail has a great future ahead with customers actively seeking out great quality products and independent designers both online and offline. I think bricks-and-mortar will always play a key part as people like to interact both with the products and the people making or sourcing them."